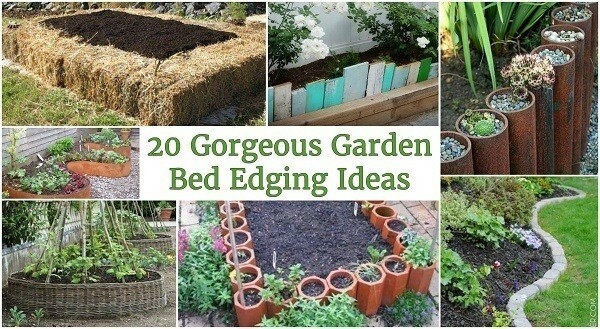 Here’s a couple of beautiful and creative ideas to keep grass and weeds out, and your vegetables and flowers in. Though it may not be the most effective tool at keeping grass out, these tall stacked wheels are great at keeping abundant foliage from your garden or fence-line contained so that you aren’t constantly guessing where to mow. This simple hewn low-stone border is the perfect choice for a low attention divider. I works particularly well in conjunction with sloped gardens. A Gabion wall is a caged wall, here being filled with large stones to hold back a terraced section of garden. The interspaced wooden blocks give it a home and well defined fenced-in impression. If you save old wood from construction projects or just lumber you get from scrap, sawing out some boards can be a flavorful touch on a wall flower bed. Perfect to pair with brick, these pipes allow for a raised flowerbed on a solid surface, which keeps weeds well out of the picture and a uniform color to grab the attention of anyone. For a much more stable yard garden with muted neutral tone, these cement blocks make for a great base to build a raised box garden that can be expanded on at a later time. Any rusted or old metal piping can serve a double purpose: excellent structure to provide support to a tall raised garden and grow mini-gardens of succulents in each pipe to provide a unique statement. If you have limited space, but want to grow and access a wide range of plants, creating a u-shaped garden can be an excellent solution. Try it for a vegetable garden this year! Tight woven fibers allow for dynamically flexible garden box shape. These work particularly well in circle shapes as well as looking stunning! If you’re looking for a harder edge to separate your garden from your lawn, but to keep a little rustic charm and definition, double up your brick or stone laying with a buried spacer row. To add even more color to a beautiful garden without detracting from functionality or your plants, row bottles up with opaque colors. Wine bottles, jars, and medicinal bottle work very well! If you’re looking for an impressive design that’s sure to grab everyones attention with a incredibly organic feeling, this branch weaving process is both elaborate and gorgeous. Straw is a wonderfully effective medium for preventing weed growth were you don’t need extra work. A straw bale garden also carries with it a charming country visual, and is easy to deconstruct. For hard-to-manage spacing in flowerbeds in tight spaces, warping sheet metal before burying it can give you the most flexible options for garden shaping around. Especially in the case of vines and creeping plants, one felled tree can do the trick! Stacking vertical sections of tree trunk is remarkably stable as well as aesthetically pleasing. For the utmost visual definition, a railway sleeper is the way to go. Large aged blocked unevenly tiered is excellent for spacing and layering your plants. For any heavy type of shingling your garden into separate tiers, a rough hewn stone is great for excellent low support. Try it for leveling hills against building faces! For a cute miniature fence, cutting a pallet into small sections can give you a adorable low divider and help mark pathways. Poured concrete is the best choice for a lawn-mowing carefree approach, and works well if your concern isn’t as much about weeds, but having a obvious gap between your garden and your lawn. If your yard doesn’t end in a fence, but blends into a wooded lot, a stone ‘creek bed’ style divider can be a great visual seperation of yard from overgrowth, even if the far edge is tended plants.